Films we didn't expect to be good...but they were! We love watching films, we even used to write a monthly round-up of what we'd watched. Whilst our viewing habits have changed slightly since then and we don't watch as many films, we still enjoy nothing more than movie night. We love thrillers and horrors mainly but will give most things a go. Finding a good thriller or horror these days though can be pretty difficult and we've watched our fair share of trash. However we've also found some real gems that we strongly believe you need to watch. 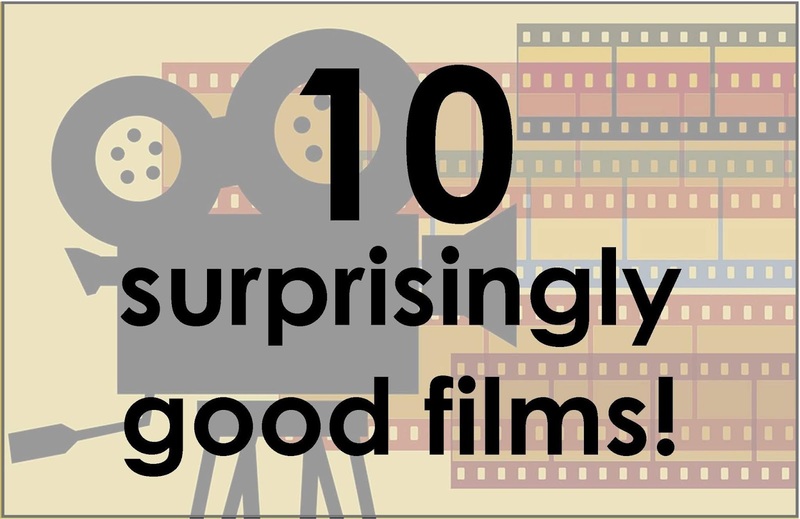 So here are our top 10 films that we went into with zero expectations and came out loving! A young boy, Tim, and his mother are picked up by a taxi driver, Bob, who murders Tim's mum then keeps the boy as has protegee, making him clean up after the murders he commits. As Tim gets older (he is renamed as Rabbit), Bob makes it clear that he'd like his unwilling apprentice to follow in his footsteps. Rabbit must decide whether to join Bob or make an escape attempt. I raved about this film for so long after watching it and still recommend it now. It's a rollercoaster of emotion so certainly not one to watch if you're after something easier but this film made what could have been a trashy slasher movie into something great. It was so different to anything else I've watched, it was deeply thoughtful, difficult to watch, raised a lot of questions and ultimately shook up a genre of film that's at risk of becoming stale. After the death of sixteen year old Alice, her family calls in a psychic and they quickly learn the teen was leading a double life. When mysterious things start happening around the house, the family are more convinced than ever that Alice has unfinished business and set about trying to unravel her secretive life. This is shot in a faux-documentary style which usually puts me straight off a film, however this one was done so well it wasn't too hard to believe that what I was watching was a real story. This is by no means a fast-paced jump scare horror but what it does oh so well is to completely wrap you up in the narrative and hits you with another twist just as you smugly thought you'd got it all figured out. Oh and no spoilers here but you're going to want to take note of the creepy photos as the credits begin to roll. Five office workers get trapped in an elevator between floors and soon realise one of them is the Devil. Each person in the lift has to face who they are and what they've done before they become the next victim. It would have been ever so easy for Devil to be just another tacky horror, after all there's nothing groundbreaking about its format or story. Even though I remember correctly calling who the Devil is quite early on in the film it didn't take away from my enjoyment. There's plenty of suspense and atmospheric moments within this one whilst not calling for the attention and investment that the previous two films on this list needed. A parody of 'found footage' horror movies, namely Paranormal Activity, A Haunted House focuses on a young couple, Malcolm and Kisha, who have just moved in together. Fearing the house may be haunted, they set up camera's to try and capture the ghostly goings on but it turns out to be Kisha that's possessed and Malcolm hires everyone he can think of to rid his girlfriend of the evil spirit. I can appreciate that not everyone will enjoy this film and could be seen by many as trashy but it's made it onto my list because I was in tears of laughter throughout this movie. I was a firm believer that this was going to be one of the worst films I'd ever watched but if you're in need of something light and extremely funny to watch then you have to give this ago. I find films like Paranormal Activity the worst and this film was an absolute golden piss-take of those movies! The classic 'kill or be killed' format, The Belko Experiment takes 80 people and locks them in their high-rise office block for a social experiment. An unknown voice barks out instructions through the intercom and the workers have to decide whether they're going to participate in the twisted game that wants to see 30 of them dead, if the number isn't achieved then 60 will die anyway. The Belko Experiment manages to deliver what I believe to be a somewhat realistic look at what would happen in this experiment, it splits the office workers in to two camps, those who don't want to kill anyone and those who don't mind popping off a few of their co-workers. This is by the same producer as Annabelle, don't let that put you off though, Annabelle sucked, The Belko Experiment is a vicious and violent look at human nature. When Kylie is placed on court-ordered house detention, she's forced to return to her childhood home. Her punishment is made worse by having to deal with her mother, who is convinced the house is haunted. But when Kylie also begins to notice that things aren't quite as they should be in the house she starts to wonder if there's more to it then her mother's over-active imagination. Housebound was a real gem of a find. Equal parts funny and creepy and definitely a must-see film. There's just something about this film that works so well when it could have easily fallen into the cheesy category. Written, edited and directed all by the same person, Gerard Johnstone, who actually made his feature film directorial debut with Housebound, you really do have to take your hat off to him for a job very well done. A family of three have to take refuge in a fallout shelter when a deadly virus devastates the U.S. The family gets by with their strict set of rules but when a fire is accidentally started in the shelter they must work quickly to get rid of the smoke before what lurks outside finds them. Say hello to an outstanding film by The Duffer Brothers, yes that's the same Duffer Brothers responsible for creating Stranger Things! Whilst there's an abundance of deadly virus outbreak films out there, this one manages to superbly stand out from the crowd with a fantastic cast and one amazing twist. I don't want to reveal too much about this film and the beauty is in watching it for youself, but watch it you must! Sixteen-year-old John is not a serial killer, but he could be. He has homicidal tendencies and a morbid obsession with death which he tries to keep in check with the help of a therapists but when a real serial killer goes on a rampage in his town, John must connect with his darkest demons to protect his family. Oh god I loved this film. Seriously how this film is not more popular I do not know. The cast is absolutely brilliant, especially Max Records as John. You have to go in with an open mind as although for the most part it seems like a traditional thriller, there's definitely some genre-bending going on here, though I personally think that makes this film even greater. It has everything I want in a film, dry humour, thrills, suspense, horror and excellent acting. Just go and watch it, you can thank me later! On a side not, the film is based off a book of the same title which I may just have to read. Authour, Maddie has secluded herself from society in her home in the middle of the woods. Her world is silent after completely losing her hearing in her teens. When a masked killer appears at Maddie's window it would seem the she's at his mercy, but the killer may have underestimated his prey. As the main character is a deaf mute, there is very little dialogue in this film. The suspense is beautifully built via the various ambient sounds used throughout the film. If you're bored by the traditional horror slasher films, you need to give Hush a watch. It's wonderfully scary and the silent world of Maddie adds to the creepiness of the film. Definitely one of the past slasher films of our time. Following four vampire roommates trying to get by in the modern world. The group show the "documentary crew" their nightly routine from fighting over keeping the house tidy, to looking for ladies and antagonizing over the local werewolves, these vampire's do not have it easy! What We Do in the Shadows is written, directed by and stars Jemaine Clement and Taika Waititi. Now if you now a thing or two about films then you'll know that Clement voiced Tamatoa in Moana and Waititi wrote the initial screenplay fro Moana. But a Disney film this is not. What we have here is a rip-roaring comedy and genre spoof. Again these is another film that could've quickly and easily fallen into the cheese pile but manages to create something wonderfully funny and a genuinely great film that really deserves more exposure. There was supposed to be a sequel to this focusing on the werewolves but production has been stopped which makes me a little sad. If you're after a good laugh that runs alongside a well-made movie, this is the one for you! We highly recommend giving all these films a watch, they just might surprise you like they did us!